Sunlight flickering on the little cup and saucer had caught my eye. At three and a half, I was tall enough to see the top of the cabinet, but not quite tall enough to reach. I clambered up on the chair that stood along side. As my fingers ventured towards the cup, Nana's voice rang out, "Come away, come away. Keep your wee mitts off of that." My lower lip began to quiver, as I beetled down from the chair. A gentle arm soothed round my shoulder and I snuggled in for a cuddle. "I didn't mean to give you a fright, lassie; I was afraid you'd break Mary's cup. That wee cup and saucer are a family treasure." Treasure - family treasure - I had no idea our family had treasure! "Who's Mary?" I puzzled aloud. It had never occurred to me that my Nana might have a sister. She stood very still for a moment, then flashed me a wink, "Let's make a pot of tea and I'll tell you about Mary and the wee cup and saucer." From my perch on the kitchen stool, I watched as Nana drew water for tea and rustled through her biscuit tins in search of Melting Moments, my favourite cookie. A stern look came my way, "Stay put. I'll be right back." I could hear her rummaging in the hall closet and was tempted to slip down from the little stool and have a peek at what she was up to, but I didn't. I stayed put and listened to the clock tick as my fingers traced the fruit patterns on the tablecloth. Mr. Kettle whistled for Nana to return and finish making our tea. set them on the table. As the tea steeped, she stared out the window. I thought I saw a tear in my Nana's eye. Fetching herself up, she reached into her apron pocket, withdrew a small, black and white photograph and placed it between us. "Have a look at those big hazel eyes. You have her honey blonde hair, lassie. Can you see the flower shaped buttons on the bodice of her dress? Will you look at those big, puffed sleeves; it's a mercy we don't have those to contend with now." "Our Mary was a bonnie lass. My, oh my, how she loved to sing, a little songbird she was; and clever, as clever a girl as you'll ever meet. Our Pa taught the wee mite to read before she was five years of age." Memories of Mary filled the air. "Mary became very ill; she was but a girl when she died." Nana spoke no more of that: she told of picnics in the glen and gathering shells at the shore; of Mary's giggle, when kitty licked her nose; and of how she had come to own the wee cup and saucer. When Mary could no longer venture forth on her own, her family would take her out in the buggy for a stroll. On a Saturday, they might stop for a sweetie at The Tuck Shop. It was on just such an outing with her Pa that Mary had spied the wee cup and saucer. So captivated had she been, Pa had lifted her from the buggy and carried her inside the shop for a closer look. She knew her Pa could not afford to buy such a thing, but oh, how pleased she'd been to admire it up close. Without a word to Mary, Pa had returned to the shop and arranged for the cup and saucer to be set aside. From his shoemaker's wages, small payments would be made until the full purchase price had been settled on the shopkeeper. On Easter Sunday morning of 1898, Mary received the wee cup and saucer. She took her tea from it every Sunday thereafter. A soft smile played on Nana's face. "Porcelain is very delicate, so you must hold it gently and take care not to drop it." As the emerald green demi-cup was placed in the palm of my hand, goosebumps traveled up my arm. Ever so slowly, my eyes took in the narrow band of beaded gold that circled the rim and the tiny gold teardrops cascading down to the footed base. In turn I held the hand painted saucer with its three soft green leaves and single white blossom. I squealed with delight when I spotted a tiny red raspberry nestled under the leaves. 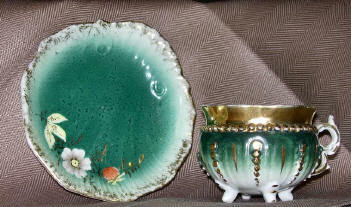 I envied Mary, for she had taken her tea from this wee cup and saucer. Nana slipped the saucer from my hand and laid it before me. Raising the little cup, she began to pour the tea. I sat spellbound with anticipation, as she added a few drops of milk and gave it a stir. "There you go, lassie. Have yourself a fine cup of tea." Mary's mother - my great grandmother - tucked the treasured cup and saucer safely amongst her linens when she 'crossed the pond' to Canada in 1907. They would pass to Nana, when Great-granny died in 1928 and to my mother when Nana died in 1958. On a warm summer's eve in 1976, my mother passed the wee cup and saucer along to me. On that night, I would come to know the nature of Mary's illness. Mary Smith Balfour Watson was born in Maybole, Ayrshire, Scotland in August of 1892. 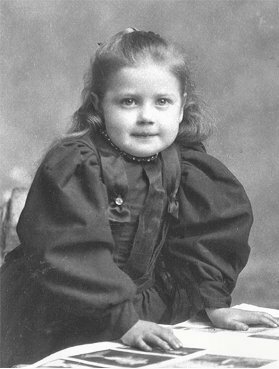 One day short of her seventh birthday, her life would be lost to a tubercular hemorrhage. The first symptoms had begun to appear when she turned four. As the disease progressed, she developed a curve in the mid-section of her backbone and her chest thickened. Unable to hold herself upright, she had to be carried everywhere. Not having children of my own, I often wondered to whom the wee cup and saucer would pass. One winter's night, my niece, aged four at the time, was at my house for a sleepover. She was colouring, as I wrote a letter. Glancing over to the hutch and the little treasures I kept on it, she asked, "Auntie Carol, where did you get the little cup and saucer?" Memories of a bygone day echoed through my heart. "Well, Carly," I said, "let's make a pot of tea and I'll tell you about Mary and the wee cup and saucer." Carol McLellan's story about Mary Watson (1892-1899) is one of several contributions she has made to the Maybole website. See Postcards from Canada and more family photos.